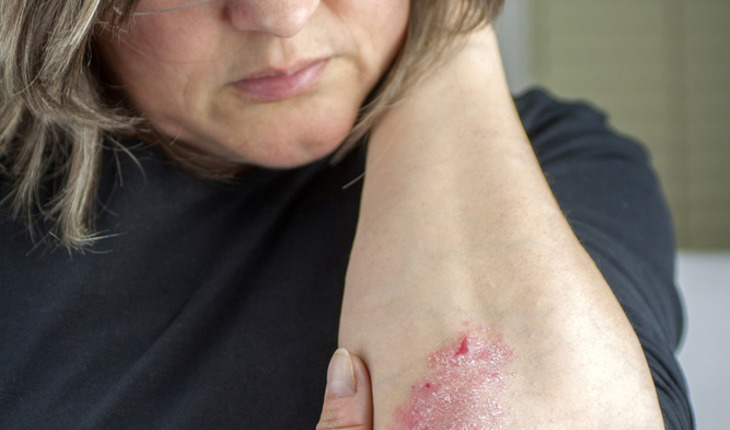 Patients with more severe psoriasis are also more likely to have uncontrolled hypertension, according to research done at the Perelman School of Medicine at the University of Pennsylvania. Through a cross-sectional study using information collected from a medical records database, the results provide further evidence of a strong link between psoriasis and hypertension. The results were published in October 2014 in JAMA Dermatology. Defining uncontrolled hypertension as blood pressure measured as at least 140/90, the researchers found a clear relationship between psoriasis and uncontrolled hypertension in patients with a confirmed diagnosis of psoriasis. Additional finding indicate there is a significant dose-response relationship, meaning that the likelihood of uncontrolled hypertension increases with greater psoriasis severity. Results of the study reveal that the patients with the highest risk of having uncontrolled blood pressure, are those with moderate to severe psoriasis, which is defined as having at least three percent of one’s body surface affected by the disease. Takeshita and colleagues examined data from a random sample of psoriasis patients included in The Health Improvement Network (THIN), an electronic medical database based in the United Kingdom that collects demographic, diagnostic, treatment, and laboratory information from a broad representative sample of the UK population. Takeshita says the psoriasis diagnostic code in the database has been validated through extensive studies looking at the condition. The researchers concentrated on a specific group within the THIN database called the Incident Health Outcomes and Psoriasis Events (iHOPE) cohort, a random sample of about 9000 patients with a confirmed diagnosis of psoriasis and disease severity classified by their general practitioners using objective measures, specifically body surface area involvement. This permitted a level of analysis not possible in previous studies. Although the work strongly suggests a correlation between hypertension and psoriasis, the cross-sectional nature of the study doesn’t allow one important issue to be addressed: the “chicken or egg” question of whether psoriasis may cause hypertension or whether the presence of hypertension contributes to psoriasis. Still, the present study provides an ideal starting point for that next investigative step. Other Penn co-authors are Daniel B Shin, MS, Nehal N Mehta, MD, MSCE, Stephen E Kimmel, MD, MSCE, David J Margolis, MD, PhD, Andrea B Troxel, ScD, and Joel M Gelfand, MD, MSCE. The research was completed in collaboration with Shuwei Wang, MD, of Thomas Jefferson University. Dr. Gelfand and his team are currently working on groundbreaking studies that are determining if psoriasis treatments such as adalimumab (a TNF inhibitor), ultraviolet light phototherapy, and ustekinumab (an IL12/23 inhibitor) can improve cardiovascular health. The study was supported by grants from the National Heart, Lung and Blood Institute (R01-HL089744), the National Institute of Arthritis and Musculoskeletal and Skin Diseases (K24-AR064310), the Dermatology Foundation Career Development Award, and the National Psoriasis Foundation Fellowship Award.